Best of the Week: Tannoy Legacy comeback, first Philips OLED TV, Pro-Ject vertical turntable | What Hi-Fi? This week, Tannoy announced plans to bring back its Legacy speaker range, Pro-Ject is bringing out a wireless version of its VT-E turntable and Amazon has detailed the latest version of the Fire TV stick, now with Alexa support. For reviews, we had Philips' first OLED effort in the 55POS901F, the MTR-75 turntable from German brand Dual and Cambridge's Yoyo (M) wireless speaker. Following on from the resurrection of its Prestige range, Tannoy has reintroduced its Legacy series, which was popular in the 1970s. 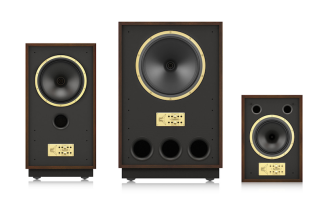 The new line-up includes the Arden, Cheviot and Eaton speakers. The original Devon and Berkeley models have been omitted. There's no word yet on a release date or price for the speakers. There's a new model of Pro-Ject's vertical VT-E turntable. The VT-E BT, as you may guess from its name, now sports Bluetooth. Despite the wireless functionality, you can still connect to traditional hi-fi as it comes supplied with a cable. The VT-E BT is available in three colours (red, white and black), and is priced £380. Amazon is bringing out a new version of its Fire TV stick that will enable support for the company's AI assistant, Alexa. The device is said to be 30 per cent faster than the previous version, with Alexa support for Netflix, BBC iPlayer and Amazon's own Prime Video. It will be available from 6th April, priced £40. "It’s the slip-ups on more essential elements that block Philips’ path to five-star glory"
Philips has brought out its first OLED TV and it's an attractive set. The Ambilight feature adds an excellent sense of immersion, and 4K and HDR are well done too. What knocks it back is the set's lack of picture subtlety, limited smart features as well as no support for Dolby Vision or HLG. It's a decent effort from Philips, just not an essential one. "It’s an affable, enjoyable performer that’s fun to use"
Dual has been absent from UK stores since the 90s, but has returned with a new range of budget to mid-range turntables. With an extensive feature list and fully automatic operation that makes it easier for vinyl novices, the MTR-75 boasts an enjoyable sound. It could be better in terms of subtlety, precision and punch, but this is nonetheless an affable performer. In trying to tick all the boxes, Cambridge has played it a touch safe. We enjoyed what Cambridge did with its Yoyo (S), so we were excited by the prospect of the bigger Yoyo (M). The sound is bigger, richer and weightier. The design is once again lovely, while the battery life is impressive, and it's an enjoyable and stylish effort. However, that thick presentation masks the speaker's detail and dynamics, which aren't as good as some of its rivals'.